When an Emergency alarm occurs, the implanted monitor in your chest vibrates and your External Patient Alerting Accessory provides a series of “beeps” and flashes the red Emergency light. The Emergency alarm has a distinctive pattern of 5 beeps in a 3 – 2 pattern, which is repeated every several seconds. Call for an ambulance right away. Tell the dispatcher of any symptoms that you may have. If you do not have symptoms, explain that you have a medical device that warns you when it detects heart problems. Look at the back of your Patient Alerting Accessory and follow any instructions written on the label. Silence the Emergency alarm of the implantable monitor using your Patient Alerting Accessory. To do this, place the Patient Alerting Accessory over your Implanted monitor and press the “stop-alerting” button. Remember, in 15 minutes you will get another alarm, called the Reminder alarm. You will need to turn this alarm off as well to cause the implanted monitor to return to monitoring mode. Take your Patient Alerting Accessory with you to the hospital. Tell the medical staff that you have an implanted device that vibrates when you have a heart problem. Also, show them your Patient ID card and your patient booklet, if available. The AngelMed Guardian does not replace your body’s ability to manifest symptoms but rather serves as an adjunct to such symptoms. If you have symptoms that you think may be a heart attack you should call 911 to be transported to the ER for assessment even when no Guardian alarm occurs. During an ACS event, Guardian alarms may occur with, or without, symptoms. In the ALERTS trial some patients had alarms but did not have any symptoms and were found to be experiencing cardiac events upon presentation to the ER. Up to 30% of patients may not have symptoms during a heart attack. 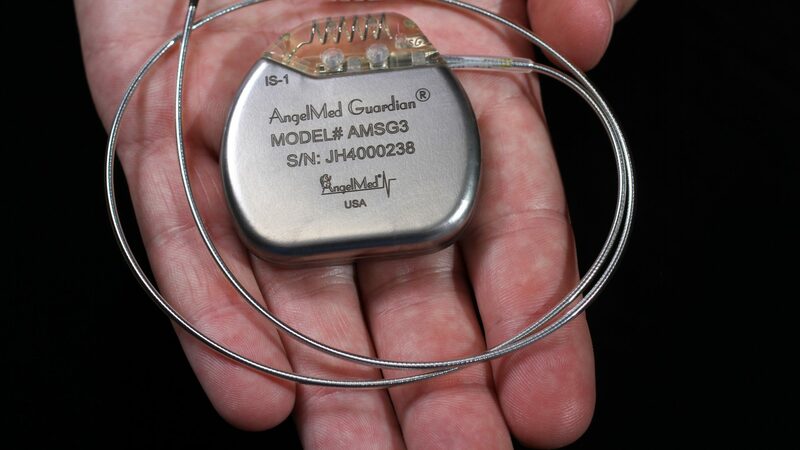 During an ACS event, symptoms may occur with, or without, a Guardian alarm. In the ALERTS trial some patients had symptoms but did not have an alarm. Heart attacks can be complicated to detect. For example, if a patient’s coronary artery becomes blocked there may still be sufficient blood-flow in the artery or in a nearby artery to compensate for this blockage. In this case the Guardian may not detect an abnormal change in the heart that is large enough to trigger an Emergency alarm. Your doctor can review symptoms you may expect during a heart attack. You can also get more information on ACS symptoms here.